This is wall to wall gain with a full body slammin’ punch to the gut distortion. Tone is our signature at Rocktron, and we just signed your ticket with this stomp box! For players who want the ultimate control over their distortion, the Reaction Distortion 1 is second to none! It has an incredible amount of gain surrounded by a super powerful and versatile EQ consisting of BASS, TREBLE, MIDDLE FREQ (Center) and MID GAIN controls, making it easy to dial up your individual tone in a matter of seconds. Rocktron’s Reaction Series pedals are built into a rugged metal slim form factor chassis, taking up as little space as possible on your pedalboard. The Reaction Distortion 1 is a TRUE BYPASS pedal: when you turn it off…it is out of your signal path! Control knobs for the Reaction Distortion 1 include GAIN, which controls the amount of distortion drive you want. LEVEL controls the output volume of the Reaction Distortion. LOW (outer control) provides Bass EQ. HIGH (inner control) handles the Treble EQ. MIDDLE FREQ (outer control) takes care of the Mid Center Frequency, while MIDDLE (inner control) handles the Mid Frequency Cut/Boost factor. That is one big load of control on this stomp box! 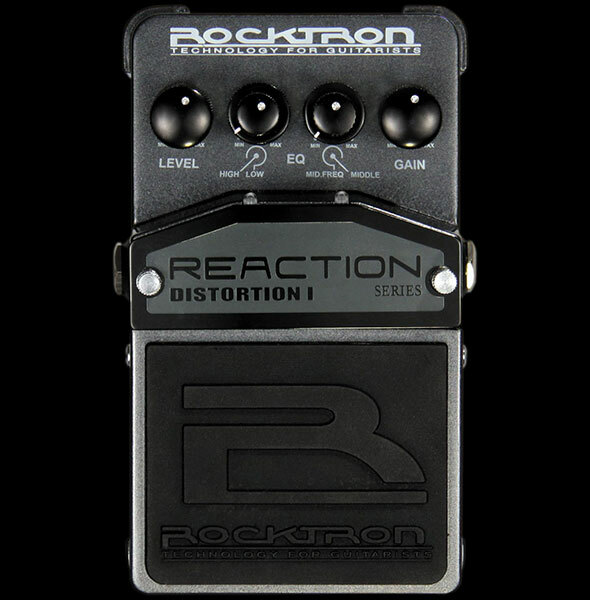 Rock your world and ours with the Reaction Distortion 1. You will have more tone than you know what to do with and when another player comes up to you after your performance and sings the praises of your tone, you will know that is exactly the REACTION you were looking for! The footswitch on the Reaction Distortion 1 controls On/Off status as shown by the LED indicator. Reaction stomp boxes run on a 9V Alkaline battery, or may also be powered by Rocktron’s DC OnTap Universal Power Supply adaptor.